J.McGale Industries offers a broad line of products with specific features for many industries. From rugged, extreme-duty equipment for underground mining, to sleek flush-mounted camera housings which can be painted to blend in discreetly with distinctive body styles - J.McGale provides the most reliable visibility solutions available. For automated trucks, J.McGale Industries provides multiple camera systems providing the driver with a view out the side of the truck. Side-mounted cameras facilitate curb access for automated trucks, greatly improving productivity and reducing the need for backing to get a missed pickup. The driver can monitor the arm as it lifts the can, and then switch cameras automatically to monitor the contents of the can as it empties into the hopper. Once he's done, the rear cam can be activated again to watch for vehicles attempting to pass. Take automation and safety to the next level. J.McGale Industries manufactures the most durable cameras available, built tough to withstand the harsh earthmoving environment. For loaders, haulers, scrapers - J.McGale Industries provides clear, reliable visibility for heavy equipment around the world. The 3rd Eye MobileVision™ series of cameras are perfectly suited to the mining and construction industries. Integrated motorized shutters are designed to keep dirt, water and mud off the lens when not in use. These heavy-duty cameras are shock resistant to 10Gs and waterproof, and are equipped with military-spec connectors to eliminate water intrusion. They offer a wide, undistorted field of view to ensure operators know what is going on around them at all times. J.McGale's camera systems for emergency vehicles offer high resolution images and a wide field-of-view to eliminate the blind spots around even the largest of vehicles. These systems facilitate safe backing and reduce accidents. Free your spotter and let the driver see for himself. J.McGale Industries camera systems for buses and recreational vehicles provide reliable visibility and a variety of mounting options for any application. 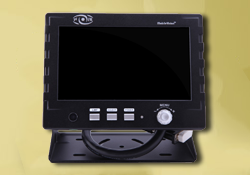 From flush-mounted camera enclosures to flat panel color LED monitors, J. McGale has a system that will fit your needs. Our video recording systems capture information that can save operators time and money, but also serve as evidence when dealing with the public. The improvement in operator performance that accompanies them being recorded adds significantly to the total cost of ownership. J. McGale Industries’ camera systems for trucks offer high resolution images and a wide field-of-view to eliminate the blind spot behind the vehicle, facilitate backing and reduce accidents. Merging into traffic also becomes easier with an on-screen distance grid to help you judge another car's distance from your rig. Heavy-duty quick-disconnect tractor-trailer cables provide reliable service.